We had a blog disaster. After much ado, the blog is back, and I think most of it is intact, excepting images that were tucked away in the wp-content folder that I overlooked. And some old photo galleries from the first couple of years. I need to get those back up in some form and also check links here and there on posts to make sure they’re reading correctly. Hacked! Yes, hacked. The blog was hacked, likely a while back, but I was stupid and didn’t realize that the drop to zero of search engine referrals signaled the hack. Discovery of it came about only because I paid attention to a peculiar search item that brought someone here, followed that, for some reason looked at the cached page of the search, and was surprised to see hundreds of obnoxious links sitting above my blog post, links that were never observed on the blog itself. That rude bit of information led to ditching of databases and assorted other maneuvers and many things acting weirdly and freaking me out. Finally, the blog was back up, but there followed the discovery that my exported xml file of the text content was too large to import. Wpsplitter salvaged what remained of my sanity, enabling me to split the XML file into multiple files. An absolutely painless process and I’m fortunate that I found it. Along the way I lost my blogroll. Kaput. I don’t know where it went but the links are no longer there. I’m tired. I have spent nearly a week laboring at this and am not done yet. Issues are still being worked out, and I have some fiddling yet to do with the CSS. I switched over to the newest Comic Press theme and don’t care for the menu bar or the fonts. Have to get that worked out. And I’m being indecisive now about whether to do the big picture format at the top which I was using or make it smaller, which is the option I’m using at the moment. I’ll probably revert back to the big picture option as soon as I’m posting this. The Apple store says their “geniuses” are very busy with repairing computers so it’s several more days before they can look at my monitor. I already know my monitor is going to cost probably (at least) $500 to repair. After 16 months in my possession, the Apple power box apparently freaked out and went bad and when it freaked out it seems to have blown a backlight in my monitor. I’m four months out of warranty and the snotty attitude and the fact that the Apple “geniuses” are backed up for days with computer repairs just makes me want to spell out I R O N Y for them real loud, with flags, while making cross-eyed faces. I woke up Tuesday morning set to spend the day devoted to working on Sue’s photos but checking my email I discovered that I was part of Dreamhost’s $7,500,000 f*** u* in which they accidentally way overcharged all their customers. Only I didn’t know this was a major all-encompassing script snafu yet. All I knew was that my account, which I always pay up for a full year every August, was being erroneously and hugely billed. When I saw the web control panel was down though I figured something was up and immediately checked their status blog to find they’d a post up about the mess. Very big mess. 26 pages of comments on that status blog. And yet more here on the regular Dreamhost blog. Then we got a parking ticket when we weren’t even in the wrong, and we have a customer receipt to prove it but who has the time to go down and protest the ticket. I worked on Sue’s photos, occasionally checking in on the Dreamhost status blog to see how things were going there. When my brother called to talk early Tuesday evening I was just about done, and ready for a break. I told him about how Sunday evening, as H.o.p. was preparing for bed, he called me in to see ALL THE BLUE AND RED LIGHTS down on the corner. Monday, we discovered that one man had been shot dead and another just shot in what was perhaps some drug-related incident. Guy died on the street, two bullets to the chest. And I realized, oh, hell, this must sound really bad considering Marty was almost caught in gunfire a month ago. Monday night, returning from photographing Sue, walking back to the apartment with H.o.p. 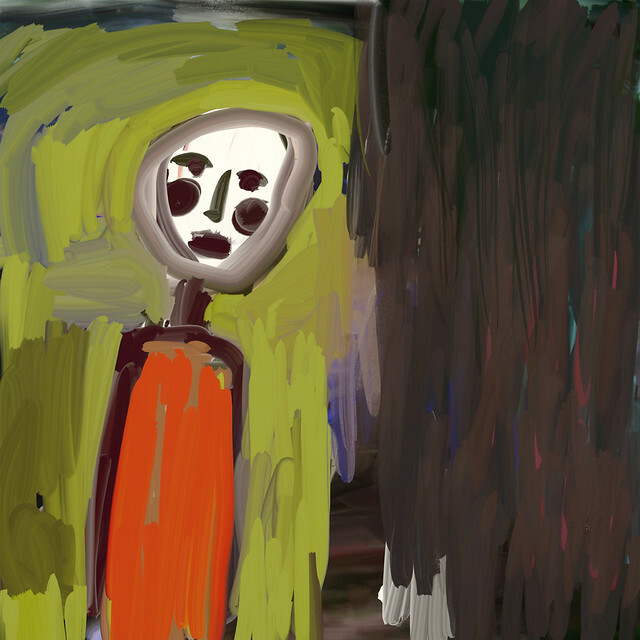 from the car, he was reticent. “Is this where the man got shot?” he asked as we passed one apartment building. “Is this where the man was killed?” he asked as we passed the next. Midtown has its problems. Today I was looking up info on the shooting and was sidetracked into reading neighborhood association crime reports for the past couple months. Crime has been worse here lately, like I didn’t know it. But it is all over Atlanta, as well, most crimes up about 25%. It snowed today. Real snow. Not sleet. Nice large flakes fairly hurled down from the skies. H.o.p. and I stopped reading Lucy and Stephen Hawking’s “George’s Secret Key to the Universe” and went outside to play. Within an hour there was enough snow to scrape off the cars lining the street and start building a small snow man on a strip of grass belonging to the condos next door. When H.o.p. and I first stepped out, we were laughing, approaching the corner, and surprise out from around the corner of the building pops a vagrant who had apparently heard us coming. “They said it would rain but God decided to make snow!” he exclaimed merrily to us, waving his arms which were covered in plastic bags. I was startled because I just don’t like people popping out from around corners. I wasn’t sure I recognized him or not but I figured he probably recognized us. I may be wrong, but I had the feeling he recognized us. I was already smiling and kept the smile on and said something about it was great, wasn’t it, thinking at the same time it’s not so great for a homeless person. I felt wary because we’d been surprised. I also felt there was no reason to be wary. But he’d surprised me, popping around the corner, and so I was wary. I waited for him to hit me up for some money, but he didn’t. And I had no money on me, having just stepped outside to play with H.o.p. I’d only my keys with me. The vagrant went on his way and I was torn between not liking being surprised and wishing I’d had a couple dollars on me to pass to him on a snowy afternoon. Anyway, H.o.p. and I, after throwing snowballs at each other, and storing a few in plastic bags in the freezer, scraped together enough snow off the cars to make a small snow man with a snow ball in his twig hand. None of the pedestrians passing seemed very elated by the snow and most seemed to take no notice of us frolicking. After a couple of hours of play, H.o.p. was soaked, it was getting dark, I made him go inside and then, realizing the snowman was likely to be accidentally stomped on by dog walkers, I moved it to a more secure plot of green by the building across the street, a spot where H.o.p. could admire our work from our window. Then, while I stood at the window watching the snow in the dark, a pedestrian likely on his way home from MARTA, passing the small foot-high snowman, stopped, looked, looked again. 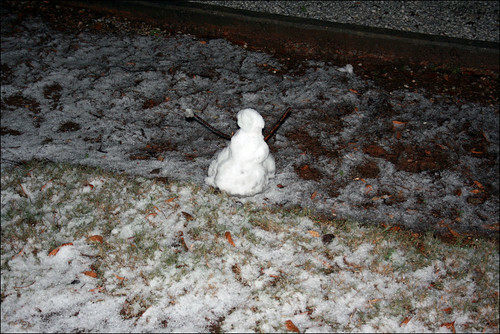 He stood a moment looking at the snowman then took out his cell phone and photographed the paltry little guy. He crouched down and moved in and photographed it twice more. Then went on his way. “Our snow man made someone happy,” I called to H.o.p. Animated Shorts – I will at some point derive some benefit from this, won’t I? If I made animations, this is what they’d look like. Every so often I think of doing animations like that. Posted on August 30, 2007 September 14, 2012 Categories Art-PaintingsTags animated shorts series, computer and stuff (probably be damned)8 Comments on Animated Shorts – I will at some point derive some benefit from this, won’t I? 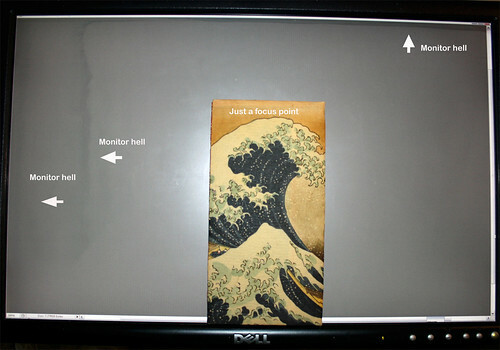 For a while I’ve been writing about the hell I’ve been going through with my Dell monitor. Well, here it is. Thought I’d picture it for you. Click on the image to see it bigger at Flickr. This is my canvas. It’s canvas hell. I forget what I spent on this monitor, which I’ve had for a year-and-a-half, but it was somewhere in the order of $500 to $600. This may not be much for some people but it was a lot for me. It was supposed to have a great range of grays for a flat screen monitor. I was really pleased with it out of the box. This is called “image persistence” rather than “burn in” (on my Viewsonic CRT I never experienced burn in) and it seems some Dell monitors really have a problem with it. I have tried all these tips for getting rid of it and have always used a changing screen saver, but the problems with mine seem to be irreversible. What I don’t understand about the idea of image persistence is how, on the left, it is this huge blotch encroaching on my screen and doesn’t correspond with any “image”. It’s just like the ocean eating up beach real estate. I go between fits of trying to ignore this and weeping copious inner tears. When I am able, I may go back to a behemoth CRT. Any excuse for a flying saucer op. H.o.p.’s computer has died. Over the past few days it started shutting down whenever he tried to do anything on it and finally refused to cut on. We ran diagnostics on it beforehand and nothing was helping. We cleaned it out. Last night it completely failed. It’s on its way to the shop and we’re hoping it’s just a power supply thing. 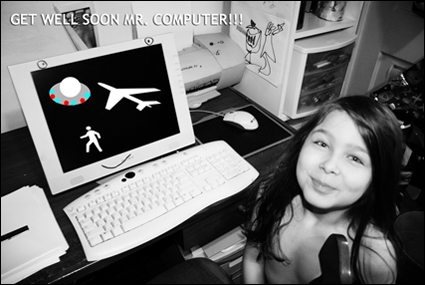 In the meanwhile, a sick computer is an excuse for a get well message because flying saucers must be appended to everything. I like the smiley computer face. H.o.p. always draws a smiley face on his monitors. Physically, I mean. It’s not a virtual smiley face. It is on his monitor and merrily greets him every time he sits down before it. My brother-in-law calls. H.o.p. picks up the phone. They talk a long time about cartoons. “Is it a Looney Tunes?” I hear H.o.p. say. The serial arsonist (well, the accused) who attempted to torch the apartment building autumn before last (or is accused of it) was in court this week. I don’t know what happened with that. I have heard it turns out he knew one of the tenants. Perhaps that explains how he got inside the building. I go to the Atlanta Journal Constitution online to see if they’ve any news on the case but there’s no report. There are however those pics of the Japanese Prime Minister with the Bush and Presley families. There are first 13 pictures of the Prime Minister enjoying himself at Graceland. A number of pics of the folks having fun putting on Elvis’ aviator sunglasses. And then pic 14 shows “Civil rights leader Benjajin Hooks accompanies Bush and Koizumi at the Lorraine Motel in Memphis, where Martin Luther King Jr. was assassinated. The hotel visit followed a tour of Gracelend.” Then pictures 15 and 16 show the Prez and Prime Minister having bar-b-que. 13 pics of Graceland and aviator glasses. 1 pic giving a nod to Martin Luther King. 2 pics decoted to bar-b-que. H.o.p. is going through stop animation blogs. One is kept by a guy in Louisiana who in April was writing about how difficult it is to find some materials for his stop animation puppets in the hardware stores with the rebuilding after Katrina. Speaking of Katrina, I have another picture I’m working on right now, a restoration of a photo damaged by Katrina. Get the photos through the hard work of the people at Operation Photo Rescue. This one is a black and white image of a woman seated on a sliver of moon, backdropped by a painted background of evergreens, lake and mountain. I wonder where she was. This has been a fun one. The OPR people continue to upgrade the efficiency of things, making it easier to connect restorers with images, and have put together a forum for news and sharing tips etc. A remarkable thing they’ve doing. A lot of the photos to be restored seem to be wedding photos and baby photos. The wedding photos and baby photos are a top emotional priority for people. But that isn’t all. Photos of people cooking. Photos of people playing. Servicemen lounging with sweethearts on Louisiana lawns. Priests with parishoners and infants being christened, reflecting the Roman Catholic heritage of the area. Photos of sailors reflecting the seaport heritage of the city. As you work and go through the photos it becomes more and more like rescuing an underground history of an area. These aren’t the images that show up in historical societies. They’re the ones tucked into people’s home albums (many glued by the flood waters to the plastic sleeves) and the snapshots in the shoeboxes, the polaroids with names of individuls penned in at the bottom. Women throw flowers at their weddings, couples cut cakes, infants peer up at the flash of their first photograph. 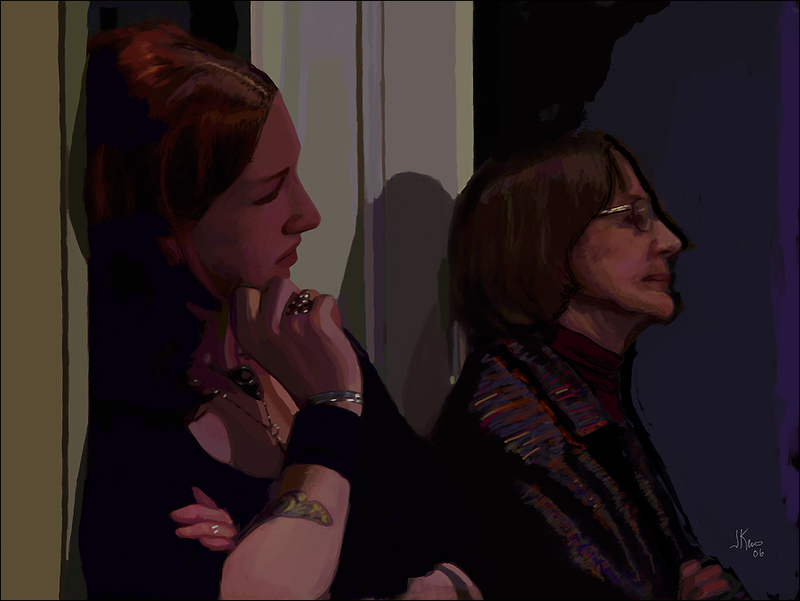 It was a painting I was working on and had just finished when the computer went down, based on a photo from the Carllile concert. So, my computer is getting pretty much back to speed. I’m missing still a large chunk of critical info (really really critical info) but it is still on my old computer thankfully, the one I switched over from in January, hadn’t erased that yet. Won’t be able to transfer that over until sometime next week. And I have more memory coming the beginning of next week. Spent this afternoon working on getting my files that weren’t lost loaded back in. Anyway, it was this afternoon I discovered some files on one of my drives were lost. Almost an entire folder of writing. There may be more missing. But I at least have a copy of that huge chunk of stuff and will next week be able to compare the old computer with this one and make sure I didn’t lose more that was on that particular drive that was bad. Dean will never read this but thanks Dean! When he got back in town he got on things and helped us right out. Immensely grateful. Have started trying to catch up a bit. Marty’s been down at the studio pretty much 18 hours a day since May 1st, was working on the Carllile mixes and the Takana/Junko sessions and now the Millennium Foundation CD. Some of the players on the Millennium Foundation CD thus far are Liz Wright, Marcus Printup, Earl Klugh, and Stevie Wonder committed today to play on a track. The person financing the project is donating every penny of the gross to the Millennium Foundation which is concerned with building infrastrcture in subsaharan communities. Marty says it’s the same org with which Angelina Jolie and Bono are involved. They have nothing to do with this CD project, just IDing the org there. Man, no wonder I’m feeling ready for us all to get on the road and have a vacation, spend some time together doing something fun. In lieu, I perused Disccvery.com and purchased several ancient history DVDs that H.o.p. will probably like and a handheld magnifier for ogling the things nearby close up. A set of my cacti sprang up a full inch one day this week. Suddenly, boom. And sent up 7 new cacti through the soil the next day. Amazing. I’d looked at that set of cactus when cutting off the grow light the night before this happened and thought to myself they looked like they were almost glowing iridescent green. Then the next day there was a full inch of new growth at the top. Maybe I should take a pic and post it. I’ve no idea what kind of cactus they are. Have a set of I believe the same type up front in a window and they’re not growing much at all though they get daylight. It looks different around here, doesn’t it? But I’ve got some tweaking to do. A fair bit of it. Am not settled on the shades of white to gray thing. I’m doing the web equivalent of This Old House while I am trailing tissue paper all over the place. And so has been H.o.p. When I got up today, it looked like some suburban prepubescent boys had happened by and rolled the place. A veritable joy of tissue streamers spiderwebbing wall to wall, which is appropriate as the last thing I did on the computer last night was scream bloody murder when I finished writing some mailing labels (yes, practicing my actual lack of penmanship skills) and turned back to the computer to see a big old spider hopping across the keyboard. Of course I screamed and Marty leaped from the bedroom (ten feet away, and no, come to think of it, I had to yell five times for him) and H.o.p. jumped up and down in crowing delight. I used to be able to deal with things like this but have turned into a wimp over spiders and bees and things as I get such toxic reactions to their even looking at me. The last time I was bitten by a spider, the first day we started our trip out West back in September, I had a nasty systemic reaction that lasted a couple of months. So I see spiders and run and scream for someone else to deal with the situation. Yes, I know I’m a sniveling coward and others would have me take the spiders to a garden and release them. But when that very innocuous looking spider landed on my hand in September and I gently brushed it away, look what I got for my tenderness. It bit me anyway, my hand swelled up and then I was covered in hives for weeks. Because that’s what spiders do. They bite when threatened. Just like lots of people do. But if I looked down at my keyboard and saw a wee spider-sized NSA human running across it…what do you think I’d do? Back to dusting and rearranging the web furniture as soon as I pull a little more of my brain together today. H.o.p. too is lying low. I bypassed the Dole salad bag as it was down in the double digits (way down) in popularity. A curious sort, I clicked the link at Amazon to get a look at the top 100 gourmet items being ordered this Christmas. a $7.45 box of cinnamon toohpicks! I’m old-school in the toothpick department. We’d fill old Rx bottles with cinnamon oil that we bought at the drugstore and eat them on the bus. The hotter the better. Personally, I think these babies are great for everything from weight-control to quitting smoking. Sugar free too. Packs pop in your purse. Yes, I’m a lady but I still love me some cinnamon-picks! You eat them??? I was under the impression one didn’t eat wood, but I was clearly wrong. And apparently wood has no calories or a nominal few. But what kind of wood are the toothpicks made out of? Doesn’t say. “Wood” doesn’t do it for me. Since learning about the squid in the gumbo I think it’s a good idea to ask a few questions about your food. Then I saw over on the Amazon sidebar a Back to Basics Egg and Muffin 2 slice toaster and egg poacher! Would members of my family prefer this? The reviewers all love the device and it’s said by one of them to be the hottest holiday gift around! I’d no idea, just like I didn’t know about hot toothpicks. I don’t know about lots of hot things. I am not up on the hottest of the hots. I was about to post on all this, was pressing the publish key when the power went off again. H.o.p. didn’t mind as we were working on math on his computer and had been for a while. Now that the power is back on he has not mentioned cutting back on the computer. He’s assuming I will forget about the math. I haven’t. Yeah, yeah, I know, one can do math without a computer. Go away. (Later.) Well, he remembered and wanted the computer on. I spent a good 40 minutes working on it and finally got it to cut back on, whereupon I discovered that while wrestling with it I had unplugged the mouse accidentally. And the keyboard wasn’t working so I couldn’t do a control-alt-delete restart. So had to shut off the machine and then damn wrestle with it again for another 20 or so minutes before I got it to start again. In the meanwhile I was wiping down dust behind. And then I felt the machine not only hum but really crank and I remembered that the reason this desktop hard drive was on a drawer on the floor under his desk was because this was the machine in which the CD rom exploded. And I moved away from it. Here’s my blog entry for the day the CD Rom exploded. Well, not exactly the computer. But H.o.p.’s CD Rom (Mitsumi 48x) exploded. I was at my computer, H.o.p. was at his. He had been playing his educational CDs for a while and having fun with that. Marty came up and was standing between. Suddenly there was this bang, I felt something sharp slap me in the face. What was that?! I looked down and saw a jagged piece of H.o.p.’s dinosaur CD sitting in my lap. The piece that had hit me just below my eye (another piece hit my glasses that I had sitting on my head). We looked at H.o.p.’s CD Rom. It had blown completely apart. The front of it had blown off. Pieces of CD were everywhere. The bad thing about this is that his hard drive casing sits beneath his monitor,is one of those horizontal ones. So when the CD Rom exploded it went ballistic and got me. Fortunately, H.o.p. wasn’t hit, neither was Marty. We had another CD Rom we had been planning to put in it anyway and Marty, trying to get over his jitters over the whole business, installed it. He turned on the machine. It screams now with this high siren whine and that’s it. It no longer works. H.o.p.’s computer is dead for now. Marty is going to take it to a friend tomorrow and see if he knows what is wrong with it, if it can be fixed. I hope it can be fixed as we use it for H.o.p.’s schooling and he has all his educational CDs he plays on it. Spanish, math, language skills etc. No more refurbished computers. I’m scared of this one now. I looked up online and though it is unusual, CD Rom’s have been known to explode. The reason is given as generally a cracked CD. But that CD was not cracked. (Poor H.o.p. No more dinosaur CD!) I remembered that a month or so ago H.o.p. 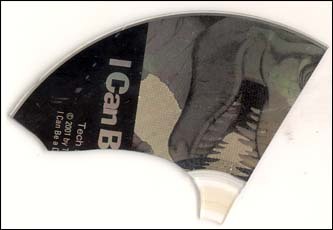 opened up the CD Rom when a game stopped working and pulled out the CD and it was split in two. I had completely forgotten about it after that night. I find this on the web about exploding CDs. Seems however they need to be moving really fast. And that an exploding CD player is extremely dangerous. Mythbusters on the Discovery Channel recently tackled the legend of exploding CDs. The legend goes that flawed CDs that are spun to 30,000+ r.p.m. in 50+X CD-ROM drives have a tendency to explode. Well, turns out that the legend is somewhat true. The guys from Mythbusters were able to get some CDs to explode by spinning them really, really fast on a fake CD-ROM drive powered by a router (the wood-working kind). They spun these CDs (and exploded many of them) in front of an unprotected gelatin mold of a human. The damage was exceptional. The exploding CDs spun outward like ninja stars, doing considerable damage to the dummy. 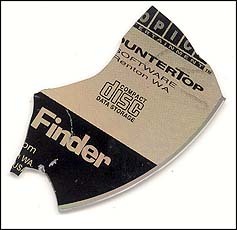 The best results were from CDs that they “pre-damaged” to simulate wear-and-tear, including one they microwaved. I find elsewhere that it is rare to happen and when it does it usually destroys the hard drive. For posterity, here are the pieces that hit me. I think the one with the dinosaur face is the one that hit me below the eye, as it was in my lap. And the piece that says “finder” I think is the one that hit my head as it was at my feet. Anyway. After we got the computer fixed (new CD Rom), we put the casing on the floor. Just in case. I will never have a CD rom sitting on a desk again. Seems like a very very long time ago when that happened. Was lucky no one’s eye was put out. Now this is what blogs are for. Wasting time in a dim-witted kind of way. Never did finish thinking about picking out Christmas gifts. Back to Amazon now. Tomorrow’s Thanksgiving. If you look back a couple of posts you’ll see the picture of a dead turkey and a comment on Edward Curtis. That’s my sideswipe version of a Thanksgiving commentary, I guess. But I hope everyone who drops by and reads this post has a good holiday weekend. Right now I’m deep in morosing over computers. No, I still have not purchased a monitor. The past couple of months when I was talking about how next we would be upgrading H.o.p.’s computer, in the next year and a half, I was pretending that my monitor wasn’t on its way to dying, sometimes not coming out of sleep mode. Then I was certain it had died and hadn’t, and then again. And finally the other day it wouldn’t come on for a number of hours and finally did and I have it now set to no sleep ever at all and we can only hope the power doesn’t go off here again for a little while like it did six times day before yesterday. At least not for an extended period.